A range of pressure vessels from 3,000 litres to 120,000 litres (upto 3m diameter x 17m long) were designed for a customer to Pressurised Equipment Directive (PED) 97/23/EC. Most of these were for the bio-mass industry. 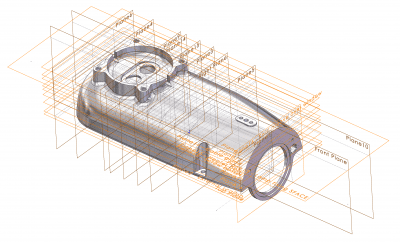 Solidworks with Simulation was used to design and analyse these products thoroughly before manufacture as due to their size, the only way a prototype could be produced was to manufacture one full size in the production materials. 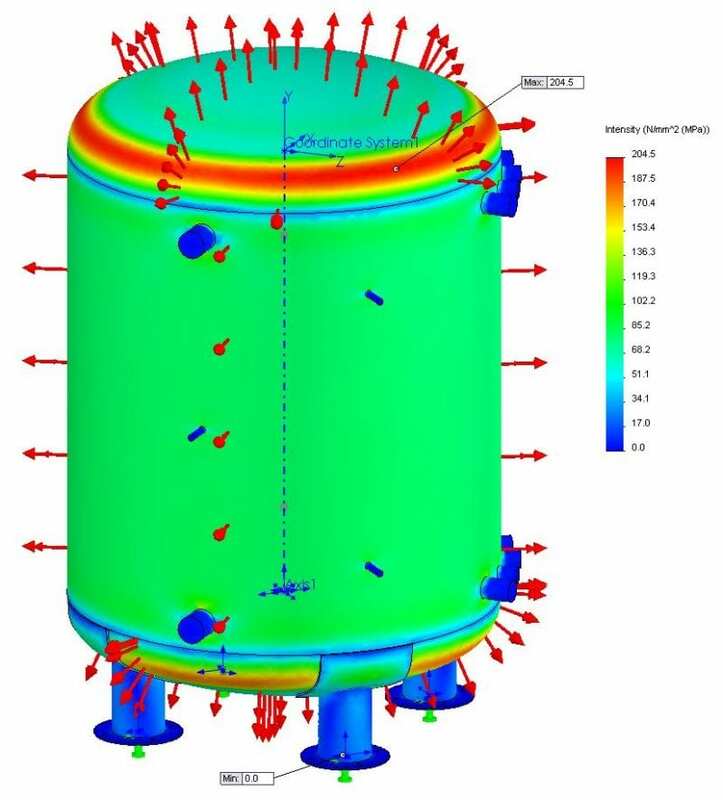 Analysis involved, stress analysis, Factor Of Safety (FOS) determination to PED, wind loading, lifting via lifting eyes and hydrostatic pressure with an analysis report issued with each design along with its manufacturing data. Large liquid storage tanks were also designed typically 80,000 to 100,000 litres in various formats with various head ends such as elliptical and torispherical. Tanks were designed for both horizontal or vertical orientations. A typical 100,000 litre tank would be 3m in diameter by 15m long. Horizontal orientation on cradles presented few design challenges but many design issues arise when orientated vertical. Wind loading and hydrostatic pressure from the liquid contents had to be carefully assessed and analysed to ensure the manufactured tank was safe. 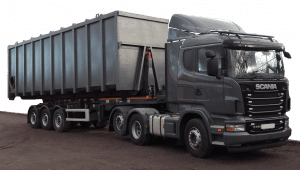 A fabricated steel hook loader tank variant was also designed as this format offered a well established and convenient way of transporting a large empty tank of 70,000 litres internal volume and external dimensions of 2.5m x 3.2m x 11m. All tanks and pressure vessels were designed with a wide range of petro-chemical type fittings for the process or use each tank or vessel was to be put. Internal access for cleaning and maintenance was provided by round or oval hinged and sealed man lids or access hatches.